Alaska: House Passes Bill Exempting Alaska From Daylight-Saving Time; Bill Moved to Alaska State Senate for discussion - The Alaska State House recently passed a bill that would exempt Alaska from observing daylight-saving time. House Bill (HB) 19, sponsored by Representative Anna Fairclough (R-Eagle River), was passed by the House on March 27, 2009. In 1983, with congressional approval, Alaska consolidated its five time zones into two. This was done to better consolidate Alaska's communities and to enable better public services. Alaska Standard Time (AST) now covers most of the state, with only a few Aleutian Islands in the Hawaiian-Aleutian Time Zone. AST is one hour earlier than Pacific Standard Time and four hours earlier then Eastern Standard Time. Rep. Fairclough sponsored this legislation in response to a number of concerns from constituents and other Alaskans regarding daylight-saving time. Her office has spent the interim and beginning of this legislative session researching the issue and asking for input from Alaskans. In a recent news release, Rep Fairclough said is clear, from two statewide polls done in 2004 and 2005, that a strong majority of Alaskan's statewide favor the repeal of DST for a variety of reasons. Alaska: Palin should stay in Juneau and work with Legislature; Palin Says Political Adversaries Allow Politics to Cloud Judgment in Final Week - With less than a week to go before the end of the legislative session, local leaders today called on Governor Sarah Palin to stay in Juneau and work with the Legislature until the end of the session. Palin is traveling to Indiana for a Vanderburgh County Right to Life event in Evansville Thursday. The next day, Palin will attend a breakfast in Evansville for S.M.I.L.E., a nonprofit organization for people with family members who have Down syndrome, according to media reports. 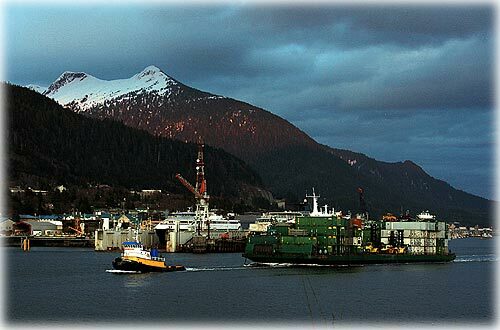 Meanwhile, unfinished business pending in Juneau includes legislation to accept the federal stimulus money, the operating and capital budgets, confirmation of Palin appointees, and selection of a replacement senator for the seat vacated recently by Juneau Senator Kim Elton. By law the 90-day session must end no later than Sunday, April 19. Legislative leaders say the session may end a few days earlier than that. Patti Higgins, Chair of the Alaska Democratic Party, said at a news conference today that by choosing to be out of state during the closing days of the legislative session, "Governor Palin is again putting her national political ambitions ahead of the needs of Alaskans and her responsibilities as Governor." "With the economy in recession, with Alaska's unemployment rate over 9 percent, and with these important bills pending that affect our economy and people's lives, where is Sarah Palin? She's half way across the country at a Right to Life event. Alaska needs a full-time Governor who is focused on the needs of Alaskans. We call on Gov. Palin to stay in Juneau and work with the legislators," Higgins said. Local Mat Su leaders Mary Kvalheim and Mike Chmielewski discussed issues pending in the legislature affecting their communities, and the implications of the Governor's absence. "The Mat Su didn't get anything in the capital budget," said Kvalheim, a former member of the Mat Su Borough Assembly. "We have three of the worst roads in the state for death and accidents, according to the Department of Transportation. Sarah Palin needs to be in Juneau fighting for a fair budget that addresses these problems." "The issues we are dealing with are hard and require hard work and focused attention," said Mike Chmielewski, a member of the Palmer City Council. "It's important for people to meet face-to-face to work things out, and Palin has to be present for that to happen." This event doesn't cost the state a dime according to a news release - the governor has no staff, not even state security, with her, though her predecessors did travel with state security even on vacations. Ketchikan: I'm Going to College - Ketchikan 5th-graders from Fawn Mountain and Point Higgins Elementary schools are busy gearing up for their May 6th visit to UAS Ketchikan. The "I'm Going to College" program is their chance to learn how they can become college students - and to see first-hand what it will be like. This national program is made possible in Alaska through a partnership between the Northwest Education Loan Association (NELA) and the Alaska Commission on Postsecondary Education (ACPE) AlaskAdvantage Programs. It enables children to participate in a variety of exercises and activities. This includes a full-day event at a nearby college campus, sponsored with support from the host institution. 2009 "I'm Going to College" events are taking place all across Alaska: the University of Alaska Fairbanks, the University of Alaska Anchorage, the University of Alaska Southeast, Ilisagvik College in Barrow, Prince William Sound Community College in Valdez, Matanuska-Susitna College, and the UAF Kuskokwim Campus and Kodiak College will also host events. About 1800 elementary students statewide will participate. National: Ponzi schemes proliferate on the Web By JAMES TEMPLE - A pyramid scheme that regularly surfaces during recessions is gaining momentum, this time supercharged by the social-networking power of the Internet, according to the Better Business Bureau and other consumer-watchdog groups. Cash-gifting programs are spreading rapidly online, popping up in growing numbers of sponsored advertisements, search results and user-generated videos on sites like Google, Yahoo and YouTube. In many cases, promoters pose in front of Web cams and count out $100 bills they say they received in the mail. They offer viewers the chance to make thousands of dollars a week from home, dismiss claims that cash gifting is a scam or illegal and encourage surfers to contact them or join their program. If Web surfers come across such videos or advertisements, "bells and whistles should be going off in your head," said Alison Southwick, a spokeswoman for the Better Business Bureau, which plans to issue a warning about cash gifting in the coming weeks. "Money is just changing hands, and most of the money is going to the people at the top of the pyramid." Thanks By MJ Cadle - I would like to thank Robert Renninger of Software Engineering of Alaska for saving me during my recent computer crisis when both my work computer and mirrored backup drive crashed fatally within days of each other leaving me without access to client files or my photos - both necessary for me to work.